Right after my husband and I got married, we were really poor. You know the kind of poor that makes it exciting to get new toothbrushes, let alone name brand toothpaste. After we had been married a few years, our jobs improved and we could finally afford a few things. 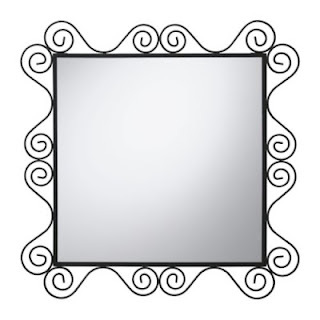 One of our very first purchases was a black iron bed for IKEA and black iron mirror called Noresund. I really like that mirror. When we moved to our new house, we had to paint all of the rooms first, so it sat in the guest room with some other frames leaning against a wall, waiting for the day when we could hang it up. One day, as I was rummaging around in the guest room, I broke it, and not the kind of I chipped the mirror. Nope, I whacked that mirror and accidentally smacked it so hard against the wall that there was broken glass all over the floor. I was crushed. Luckily, IKEA still carried the mirror, and as it was $20, we went and picked up a new one. I kept the frame because I thought it was neat, but I did not know what to do with an empty frame, plus soon after IKEA stopped carrying the mirror. I came up with idea to make a blackboard out of it after I was perusing the paint aisle at Home Depot and found blackboard paint! I wanted to make blackboards and thought that the frame would make a great place to hang it up with. I purchased a quart for about $15. I also purchased a half sheet of thin high grade plywood. I cut the piece of plywood so it would sit in the frame. I painted three very thin layers onto the plywood. I let each layer dry for 24 hours before putting on the next one. I tried to paint really lightly so that there would not be so many brush strokes on the board. I hung the board in a short hallway to the garage and it looks great! It's been fun to write different messages on it and phrase. Plus, my husband got me a box of multi-cholored chalk, so I can let my inner child shine! I had extra plywood, so I figured I would make a few extra blackboards. I cut two larger pieces and drilled two holes in the top to hang them by. I painted them and then decorated them along the edge, tied some pretty ribbon to it and gave them as presents to my sisters. I had some old extra frames in rough shape. So I spray painted them pink, cut plywood to fit. Painted the plywood, glued a few buttons around the edges and gave them as gifts to some friends with cute little girls. 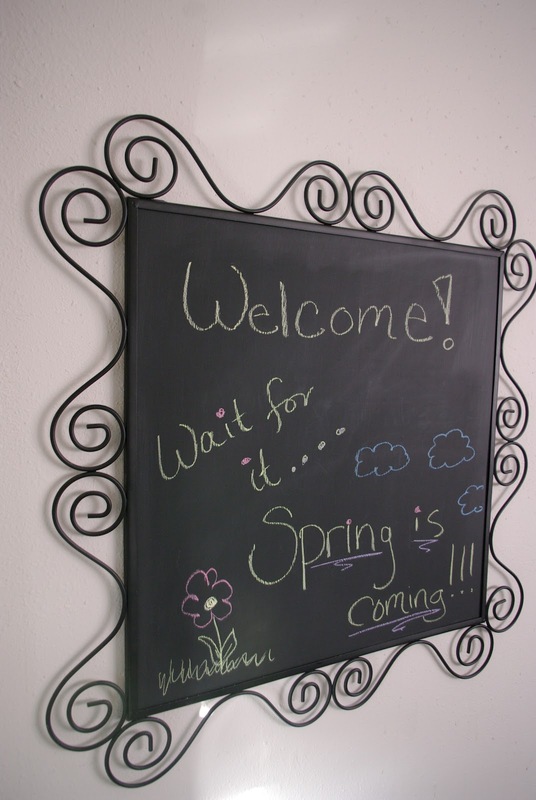 Everyone seemed to like the blackboards, and they were super cheap to make because I was just using leftover supplies! 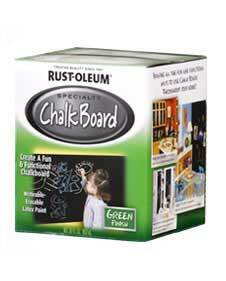 The container of chalkboard paint will go a really long way, and now they even make it in a spray paint can. Sounds like fun.